The highway from the airport cuts a cross section through Bangkok. High-rise offices and cranes silhouette the horizon; buzzing taxis swarm around overcrowded buses; massive ornate temples overlook tiny corrugated shacks; and crazy traffic jams, caused in part by the train line that crosses the highway, give you time to take it all in. The buildings that dominate the skyline are less than twenty years old, our taxi driver tells us as he zips between lanes. I ask if he likes the new buildings. He thinks on it for a while. “I like the mountains,” he says. 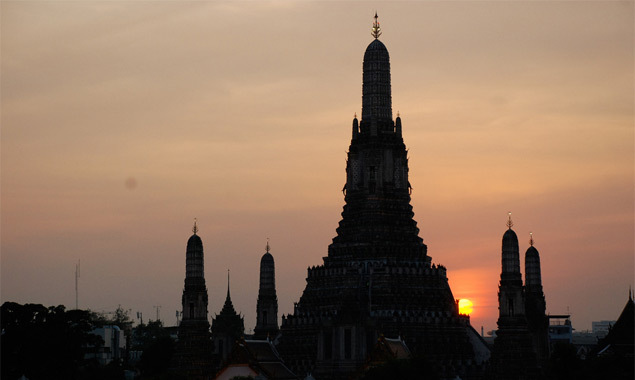 We spend a couple of days exploring Bangkok. 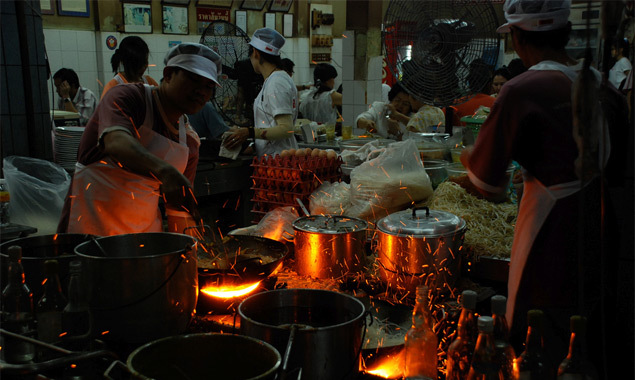 We visit temples and night markets, Pad Thai kitchens and Khao San Road. 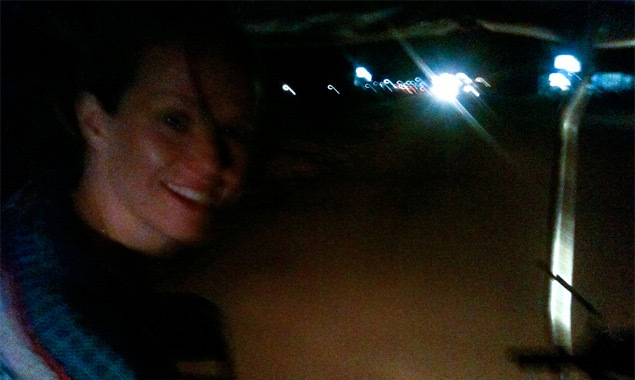 We zoom around in gutsy little tuk-tuks, which is one of the most exhilerating things I’ve ever done while drunk. Bangkok is strange and beautiful, but it’s also crowded and smelly, and like most people who arrive there we’re just passing through, already thinking ahead to what we really came for. 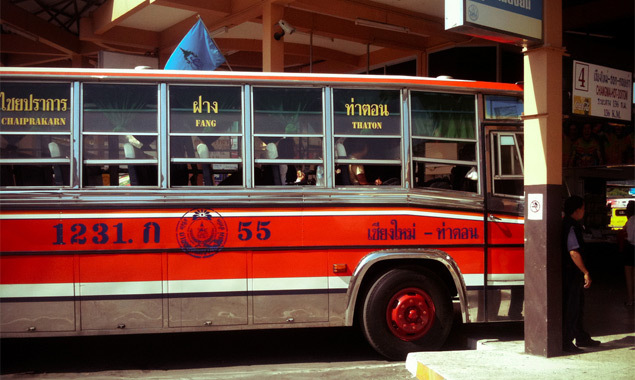 We go north to Chiang Mai, Bangkok’s more relaxed, hip younger sister. On New Year’s eve we release paper lanterns into the night sky, adding to the hundreds already up there. People gather outside temples where young monks in orange robes help people to light their lanterns and beat huge drums. Fireworks rain around us down long after midnight. For hours on end a constant stream of glowing points drift upwards from all over the city and I’m sure that it’s one of the most beautiful things I’ve seen. New year’s morning we board a bus and head north again, to a small dusty town near the Burmese border called Chiang Dao. 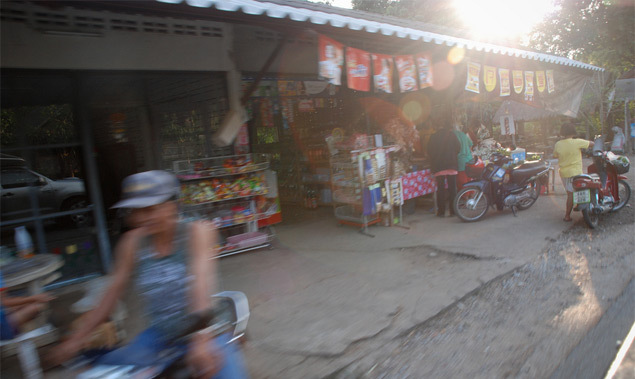 It’s not much more than a row of food stalls and shops along a single strip of asphalt. We see a sign for our accommodation, shoulder our rucksacks and decide to walk it. Shouldn’t be too far. After several miles and a couple of hand-drawn maps courtesy of the friendly locals we’re starting to regret the decision. Then a young family pulls up in a flatbed truck. (I don’t see a car the entire time we’re up north, only open-backed songthaew trucks and mopeds carrying up to four people at a time.) The family don’t speak English and we don’t speak Thai, but we all muddle through – the maps help – and hop into the back with their daughter. They drop us to our accommodation several miles away and drive back the way we came, waving as the go. Thai people are incredibly kind, friendly, and happy. 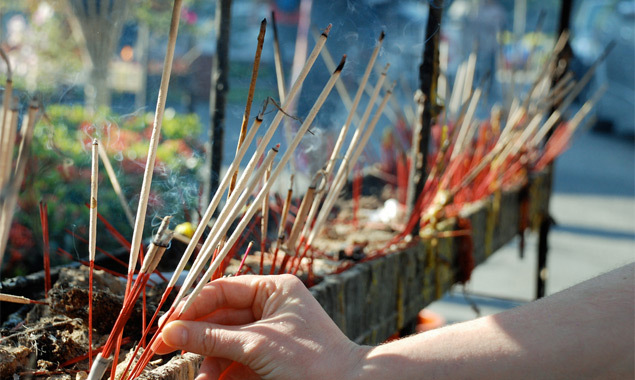 I’m not religious, but there are some aspects of the Buddhist approach that appeal. 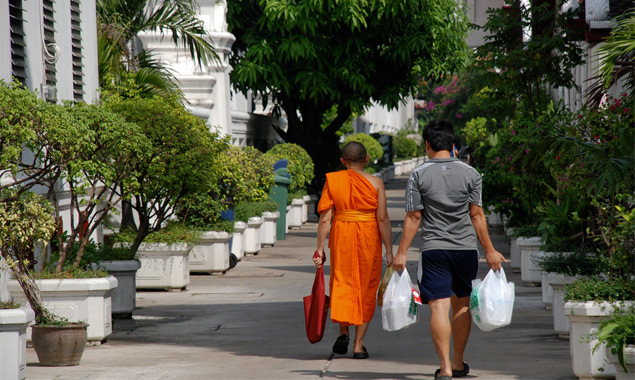 Religion seems to have left the Thais with a more constructive attitude to life than the baggage that many Irish have been left to work through. 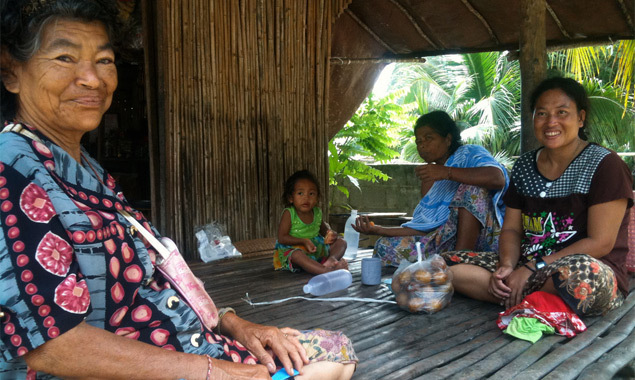 We’ve arranged to do a three day jungle trek, where we plan to spend the local new year with a hill tribe, as long as the village shaman doesn’t decide to change it to another date at the last minute. Getting sick is a constant worry in Thailand, and despite drinking only bottled water, avoiding fruit for the first few days, and washing our hands like we have OCD, I’m struck on the morning of the trek. Some kind of stomach bug. We decide to set off anyway, hoping that it will pass by the afternoon. 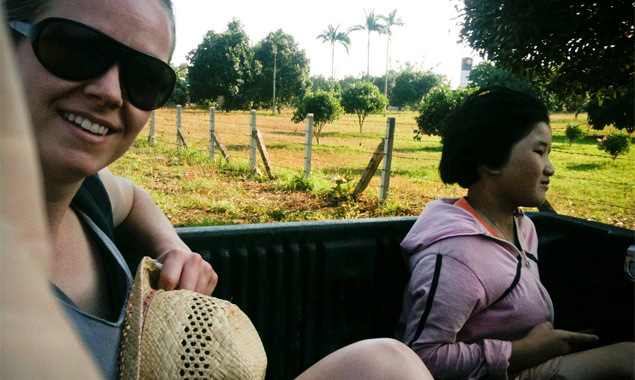 A van drives us as far as it can, an hour up into the mountains and jungle where we meet our two guides. They are quiet and don’t speak any English, but we manage to communicate with them quite well via pidgin sign language. We hike further uphill, and then down a rough path into a valley. There’s a village here. About fifty Lisu people live in a tidy huddle of huts, with their crops and animals scattered around. They are not big on talking, and neither are we, both of us knowing it would be redundant anyway. There’s no electricity or water, just people sitting in groups and working in the dark doorways of their homes. I rest in the shade of one hut, still hoping I’ll improve. We move on, up the sides of hills and down narrow trails into valleys. But by the middle of the day I’m still getting sick and can’t even keep water down. I become even more exhausted and dehydrated. It’s 35Â°C and we are due to hike 15k the next day; I could never make it. 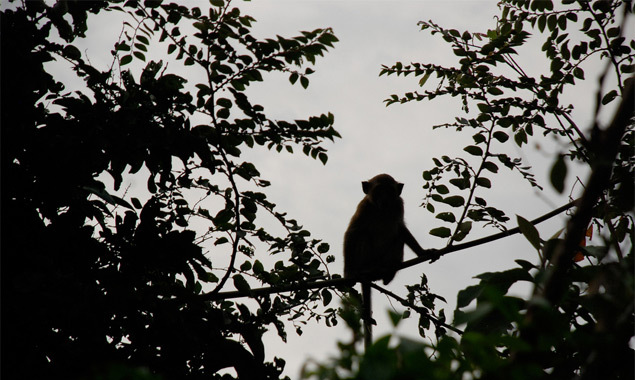 We communicate with the guides, fingers walking across open palms, rubbing stomachs, nodding, shaking heads. Maybe I could… but no. They don’t want to take us any further and I can’t go on anyway. We have to turn back. The guides carry my gear for me and make me a bamboo walking stick. I’m really feeling terrible now. The walk back to the village is tough, and by the time we get there I’m struggling just to walk. 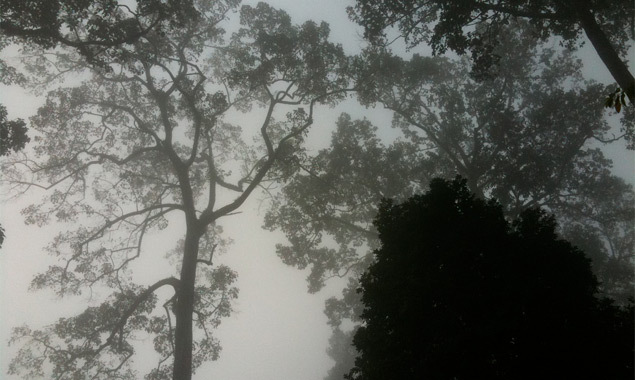 I collapse onto the porch of a bamboo hut and sleep. We radio for a 4WD to come and bail us out. I’d rather not talk about it. It takes a couple of days to get my strength back, and in the meantime Paula gets sick too. We spend two days recuperating in our little bungalow. 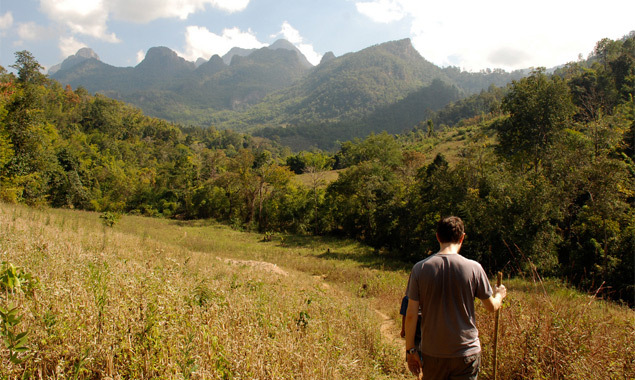 Once I’m back on my feet I have a chance to explore the Chiang Dao countryside a bit. There’s been ecstatic but off-key music on the breeze for the last two nights, and I decide to track it down. 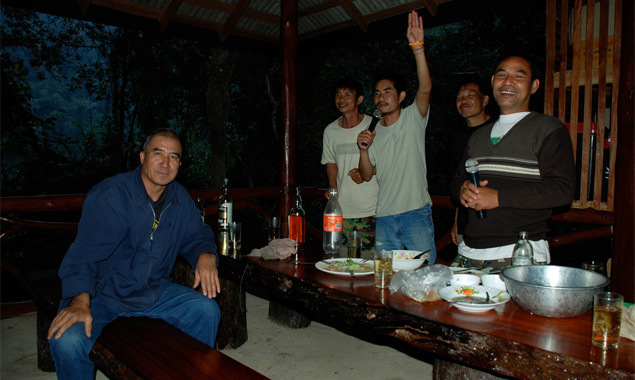 I tramp into the nearby national park and eventually find the source: eight or so ridiculously drunk Thai men who have set up their karaoke machine in an old park gazebo. As soon as he spots me, the one wearing an Osama bin Laden t-shirt springs into action, furiously waving me over while pouring a large glass of whiskey. Again there’s a language gap, but karaoke and booze don’t require much conversation anyway. They turn out to be nice guys. I leave before it gets too dark to find my way back home. We fly south to the islands, and the glorious prospect of being able to swim to escape the heat. But we land in Krabi amid torrents of rain and make the mistake of staying there to wait out the bad weather rather than head straight to the islands. With respect to any readers who may be from there, Krabi town is a shithole, and we spend the night plotting our exit in the only $2 box room we could find. Nearby there’s a notice warning that we’ll be charged for another night if we stain the bedding with chocolate, blood, or ink. Traveling always throws up moments like this, where you’re tired or grumpy or nervous, and we often choose forget about them in retrospect. The next morning is clear and bright, and the next ten days are distinctly more entertaining. 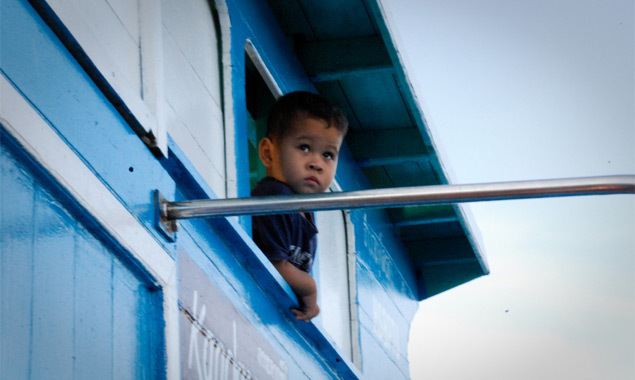 We spend most of our time on the island of Ko Lanta which is beautiful and quiet, and some on Ko Phi Phi, which is beautiful and ridiculously overcrowded. 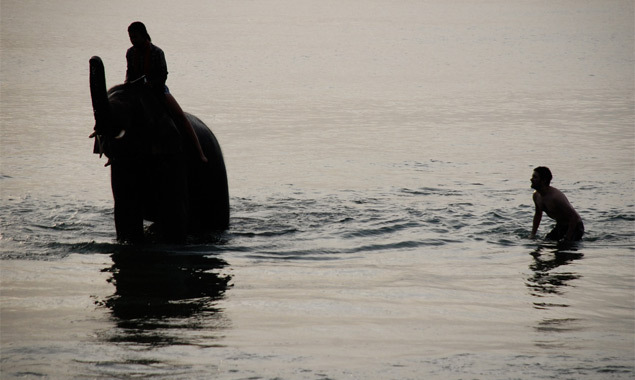 We ride mopeds across volcanic mountains to villages where sea gypsies build their houses on stilts in the sea. We go snorkeling at Ko Haa and see box fish, angel fish, fake clown fish, octopus, parrot fish, puffer fish, barracuda, black tipped sharks, sea cucumber, blue star fish, sea urchin, glowing coral and giant clams. We follow a path and find a beach, empty apart from an elephant and his owner who join me in the water where the three of us swim together. We eat red curry, mango lassi, banana pancakes, and rum ice cream. We swim through a dark cave and emerge into a small beach hidden in the centre of the island. 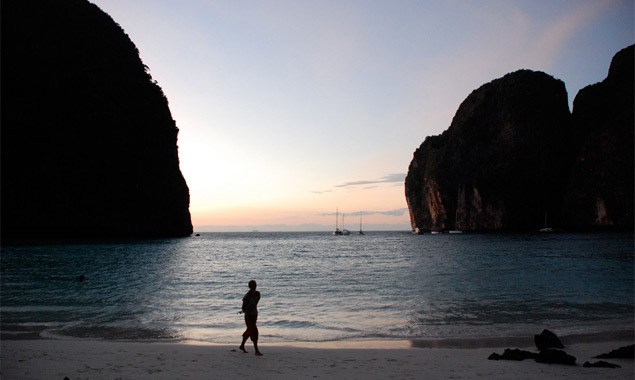 Before we go home we spend a night on Ko Phi Phi Lee, and camp out on Maya Bay beach under the millions of stars. At night the plankton in the bay glow if you agitate the water, and so with the entire galaxy clearly visible overhead we wade into the still-warm darkness, and every movement in the water leaves an electric wake of flickering lights like bright blue fireflies just beneath the surface.